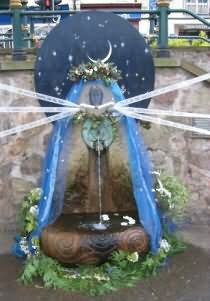 First held in 1863.Rev Thomas Keble established the tradition shortly after he had tidied up and formalized the village's main water supply in Wells Road, Bisley.The act of dressing wells with flowers has pagan origins, with its roots in the worship of the life-giving force of water but it could be that Rev Keble simply wished to mark the restoration of the wells. A similar ceremony takes place in the Derbyshire Peak District. 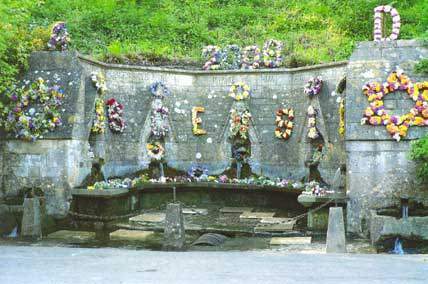 A short Church Service is followed by a Procession to the Wells where wreaths and posies are laid. The eldest 22 children in the Bluecoat village school carry the wreaths and garlands that head the procession and form the centrepiece of the ceremony. These consist of Stars of David, the letters A.D. and the year, letters spelling out the word 'Ascension' and five hoops. The custom of Well Dressing is common in the northern English County of Derbyshire and in other areas of England including the Malverns in Gloucestershire and Bisley in the Cotswolds, where this remarkable tradition remains an active part of village life today. Bisley is a large village sitting high on the Cotswolds overlooking the Frome Valley & at the head of the Toadsmoor Valley. The village is a maze of steep, winding, narrow streets which are ideal for exploring the village on foot. Many of the buildings are built from the local cotswold stone. 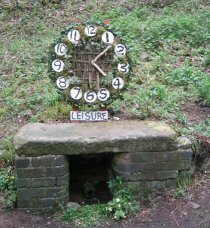 Bisley village can be found 2 miles North of Chalford and 4 miles East of Stroud. Well Dressing is thought to have originated in pagan times and was banned by the early Christians along with all other forms of water worship - but the tradition refused to die. So what is it? At its simplest, it's the art of decorating springs and wells with pictures made from local plant life. The dressings are set in clay-filled wooden trays, mounted on a wooden frame. They take hours to complete, and villagers often work through the night to finish in the early hours of the first festival morning. Some villagers dress their wells in secret. Others invite you to come along and watch - the best way to find out how it's done. The well dressing season in Derbyshire spans from May through to late September each year. There are several well dressings which occur over the same dates.